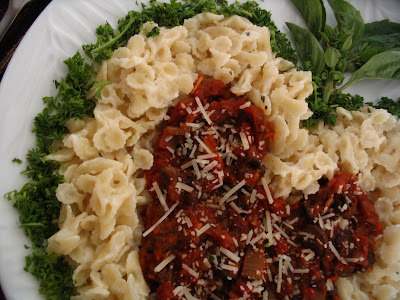 If you are pasta lover with both white and red sauce try both together in same dish. It tastes so yummy and mushroom, carrots and tomato gives good flavor to the sauce. This is one of our favorite pasta.. so I am sharing with all of you. 1. First to make white sauce heat butter or olive oil in frying pan. 2. Add the flour and saute till it is roasted or changes to very very mild brown color. 3. Add milk and whisk constantly so that lumps should not be formed. 4. When it starts thickening add the salt, pepper and dried herbs. 5. Keep it aside in low flame. 1. Heat oil in the frying pan add mushroom saute till golden brown. 2. Add the onion, grated garlic, carrots, celery one by one. saute till they all are golden brown. 3. Add the herbs and spice powders. 4. Add the tomato paste and crushed tomato add water and let it simmer to the desired consistency. 5. Now add the chopped basil. Keep it aside while we cook pasta. 1. Boil water in the big vessel add some salt. Add the pasta and cook until it is done. 2. Now add this pasta to the white sauce and toss well. 1. Spread the pasta tossed in white sauce. 2. In the top add red sauce how much your require. 3. Top with the grated Parmesan cheese. 5. Serve hot to enjoy the full flavor. you exude beauty - it is truly amazing! wow!! Its looking so yummy! !Great presentation! look at the decoration......my my!!!! Wat a creativity! U have so much patience to arrange every time and take pics! Oooooh-I've never seen pasta being presented in this manner!! 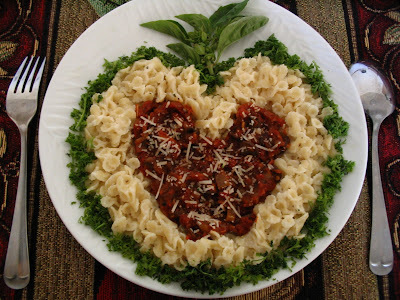 lovely picture and presentation...must try this one..
gal....how can someone create an apple with pasta?? Wwo lovely presentation. Looks so yummy. Wonderful presentation!! Keep it up!! How creative and what a beautiful way of showing the 'dish'. I often mix and match my red and white sauces...grin...love it. wow!beautifully presented, loved the recipe for red sauce ...worth trying!!! Mmmmm this is bright lovely click! Delicious idea@! Awesome dish,love the red sauce with mushrooms.Wonderful presentation. No words dear...amazing presentation!! !u re very very talented dear..! What a combo Pavithra...looks absolutely stunning...mouthwatering..
what a wonderful presentation. Absolutely love it.I love pasta and tomato sauce. Not so fond of white sauce. I really like teh recipe which u have pit for the red sauce. It seems like the u have the authentic italian recipe and thanx for sharing that. Cheers .Hope your kid is better. U said he is ill right? I am just wondering.........How could you do this!!! Never would've thought of combining white and red sauce in a pasta dish. What a delicious-sounding idea. And your presentation is breathtaking. u knw wat?am tired of saying that ur p[resentation rocks..I love anything with mushrooms..so 10/10 to u. Never had Mushrooms so far, and don't think I would too :-D .. but presentation looks fab! Another dish that is beautifully presented. Looks great! Anni you rock :) you try loads of stuff and succeed in most of it.. tats amazing. Oh, this is so sweet with two hearts in one....lovely presentation! I love your presentation! That dish sure looks delicious! The dish looks so pretty! !...how do you really dig in a fork or a spoon to eat it??.. 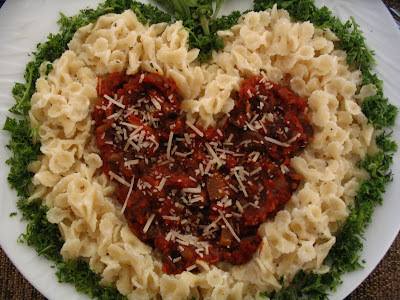 What a beautil romantic way to serve your favourite pasta dish. I too love the white & tomato sauce combination - Beautiful presentation.